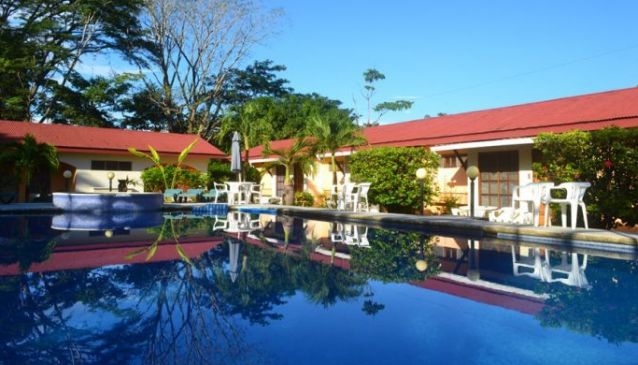 We invite you to visit Hotel Villa Creole in Jaco Costa Rica. Our quaint hotel has luxurious rooms with fully equipped kitchens, AC, WiFI, and cable TV. Our rooms are set in a wondrous garden with a pool. Our staff is trained to offer guests a truly unique stay and to provide you with all the comforts one would expect at a small boutique hotel such as Villa Creole. Our location just outside of Jaco is close enough that you can easily experience all that the town has to offer yet we are far enough away that you will have privacy, security and peace during your stay. The restaurant at Hotel Villa Creole uses the finest ingredients and serves a variety of local and international dishes for your dining pleasure. We are pet friendly at Hotel Villa Creole!